While some fans of the steampunk aesthetic might reflect their love of brass and steam with their clothing, accessories, or a few well chosen household items, others take the look a bit farther, redesigning entire home, office, and business interiors to look like something from a nonexistent version of the Victorian past. The 1800-square-foot (167 sq m) apartment was owned by the filmmaker Jeremy Noritz for years, but now it's for sale for $1.75 million. The home has two bedrooms, a kitchen, and a living room filled with gears, nautical stuff, machineries, and various other steampunkish items. Looks average from the outside. The couple founded the restoration-and-redesign business company ModVic in 2007. This was their first project. 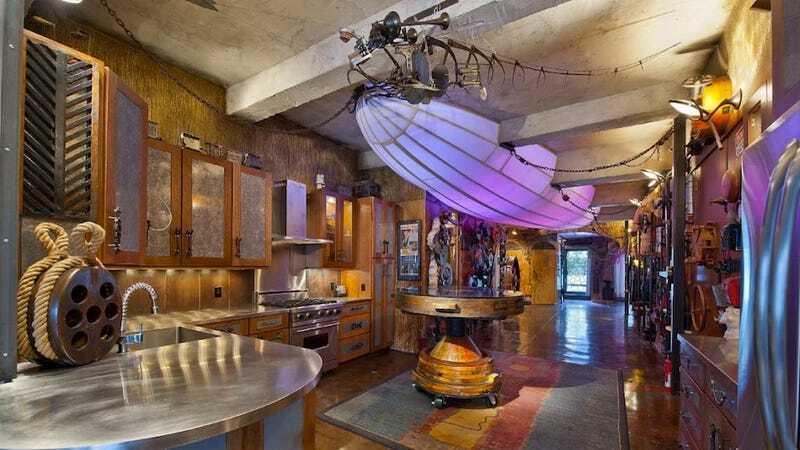 This steampunk mansion on wheels was built in 2006 for Burning Man. Made from 75% recycled materials. Designed and built by Sean Orlando and the Five Ton Crane Arts Group. Permanently installed in Milton, Delaware.